Healthy food cannot be defined by nutritional quality alone. Here at NCAT, we believe that healthy food is good for the people who grow, harvest, prepare and eat it, and for the lands and waters where it is produced. However, the common practices in our industrialized food system frequently create significant environmental and health problems. Industrial food production depends on inputs that contribute to climate change and degrade the environment via pollutants in the soil, water, and air. In the U.S. our largest healthcare expenses tend to be stroke, diabetes, cancer, and cardiovascular disease. It is no surprise that these are also among the leading causes of death in our country, and that all four are directly linked to food. Healthcare facilities have the capacity to be anchor institutions for healthy communities, not just by cultivating physical health, but environmental health through their purchasing practices as well. Research shows that social determinants may be even more important factors than clinical care in creating healthy communities. Strong communities, equitable economies, and access to healthy food are among these social determinants. Sourcing local food not only provides patients with healthier options, but it also provides a community benefit by working to achieve these social determinants. NCAT seeks to work with hospitals around Montana to utilize their purchasing power, expertise, and voice to cultivate more sustainable local food systems. We want more hospitals to be a part of the conversation and practice around creating resilient food systems through local procurement and investing upstream in public health for Montanans. Did you miss out on the Nourishing People and Sustaining Communities Farm to Healthcare conference? If so, check out these videos! You can view of all of the presentations and panels from the event to learn about how healthcare food service managers, chefs, dieticians, and administrators are looking for ways to serve fresh, local food to their clients and staff. Click here to view. 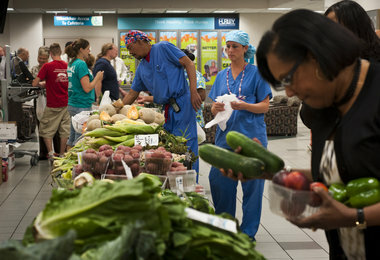 While great effort has gone into getting healthy and local food into our schools, hospitals and healthcare facilities are also working to provide patients and staff with the best food possible while looking out for the environment, cutting costs, and reducing waste. 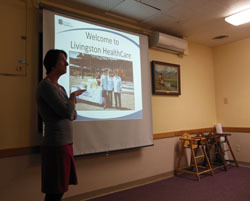 We are putting on a Farm to Healthcare conference in partnership with Livingston HealthCare called Nourishing People and Sustaining Communities on November 7, 2014. 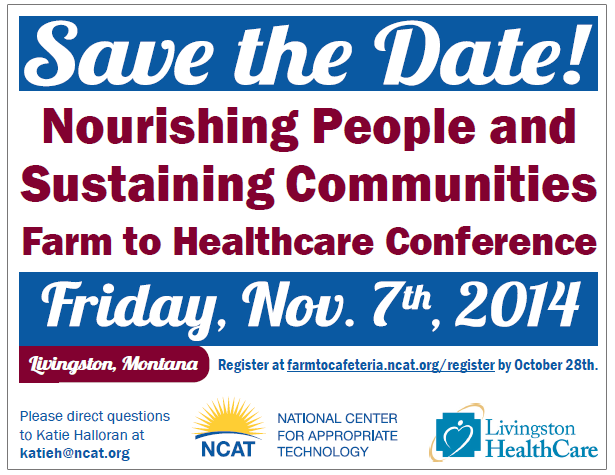 Join hospital dieticians, foodservice managers, assisted living directors, and local farmers and ranchers from around Montana to discuss the challenges and opportunities of bringing local, fresh, healthy foods into healthcare facilities for the benefit of patients, staff and communities. The day will begin at the Shane Lalani Center for the Performing Arts in Livingston, MT. Please register here if you are interested in attending. The cost is $35.00 and includes lunch. Please see the following agenda to review speakers and topics. Thank you for your interest and we look forward to seeing you there!